During a painting career that lasted just eight years, octogenarian Emily Kame Kngwarreye carved an enduring presence in the history of Australian art. By the time she passed away in September 1996, she was an artistic superstar, having created one of the most significant artistic legacies of our time. Confronted with her mythical status, journalists, art writers and critics proved inadequate to the task of dealing with the phenomenon of an artist of such stature traversing the unexplored terrain between traditional Aboriginal art and contemporary art practice. Her Sydney Morning Herald obituary reported the ‘Passing of a Home Grown Monet’, while others compared her work to that of Jackson Pollock (1912-1956), Wassily Kandinsky (1866-1944) and Henri Matisse (1869-1954). Born c1910 at Soakage Bore (Alhalkere) on the north-west boundary of Utopia Station in the Eastern Desert, Emily spent her youth as a camel driver and stock hand on pastoral properties. Outside of her ceremonial obligation in marking bold, fluid marks in ochres on the greased black skin of her country-women, she did not begin making ‘art’ until she had reached 70 years of age. She participated in the batik-making workshop that resulted in the first exhibition of Utopia batiks, held in Alice Springs in 1980. She painted her first canvas in 1987. Emily’s early painting style featured visible linear tracings following the tracks of the Kame (Yam) and animal prints, as in Emu Dreamings, with fields of fine dots partially obscuring symbolic elements and playing across the canvas’s surface. These were shown in two highly successful shows in Sydney in 1990, as well as being exhibited at the Art Gallery of New South Wales. By 1990 Emily’s output had become prodigious. At this time she and Rover Thomas (c1926-1998) became the first Aboriginal artists to regularly sell works for more than $10,000. Her output highlighted two vitally important phenomena in the history of Aboriginal art. The first was the emergence of women’s art in the Eastern and Central Deserts, which would eventually come to transcend men’s art. The second was the arrival of a new entrepreneurial sector in the Aboriginal arts industry, outside of the art centre system. By 1992, Emily’s fine dotting and symbolic under-painting gave way to works in which symbols and tracks were increasingly concealed beneath a sea of dots until eventually they were no longer evident at all. She began using larger brushes to create lines of dots that ran across vibrantly coloured haptic surfaces. These works became progressively visually abstracted and ethereal. In that same year she was one of twelve Australian artists to be awarded a two-year Creative Fellowship from the Australia Council for the Arts. Already, appreciation of her art came from international quarters with major paintings included in important exhibitions that toured Russia (1991), Japan (1992), Germany (1992), the United Kingdom (1993) and Denmark (1993) while her paintings were sought by collectors worldwide. She created her first line paintings as early as 1993 and began working in this style more intensely during the last two years of her life. Solid lines of colour, stark and unadorned, often painted on multiple panels, represented the body markings that were created during the ceremonial origins of her artistic practice. Formal compositions comprising these parallel lines eventually gave way to the meandering paths traced by the roots of the pencil yam as they forged their way through the desert sands. Arguably, the most important of these works is the monumental Big Yam Dreaming 1995 (800.0 cm x 300.0 cm) donated by Don and Janet Holt to the National Gallery of Victoria. Painted entirely in white on a black background, it has been described as the perfect bridge between Aboriginal art and international contemporary art. In 1995, Fred Torres (Aboriginal art dealer and son of Emily’s niece, Barbara Weir) initiated a workshop on the Utopia clan lands in which Emily created the masterpieces, Earth’s Creation I and Earth’s Creation II. The workshop was held during a period in which Emily was creating wildly colourful canvases by double-dipping brushes into pots of layered paint. Despite her age, Emily’s physicality was evident as she painted. Often with a brush in each hand she simultaneously pounded them down on to the canvas spreading the bristles and leaving the coagulating paint around the neck of the brush to create depth and form. In preparation for this workshop Torres prepared large canvases by hand-sewing individual panels together in such a way that Emily could paint a single painting that could later be unpicked and stretched onto several interlocking and adjoining frames. The largest and most sublime of these works, Earth’s Creation I was eventually sold for the highest price achieved at the time for an Aboriginal artist (Lawson~Menzies, Aboriginal Fine Art, Sydney, 23 May 2007, lot 60, sold $1,056,000 including buyer’s premium). It went on to become the centrepiece in her 2008 retrospective exhibition. The present work, Earth’s Creation II, was painted in the same workshop. The palette is cooler and the overall impression more subdued, yet it lacks none of the spiritual intensity and vision of her larger work. The reduced palette of predominately blue and white, with touches of red, gives the impression of floodwater after rain. Together, Earth’s Creation I and Earth’s Creation II can be seen as companion pieces. 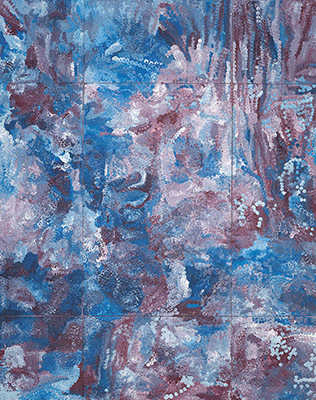 Both works exhibit an assurance in execution that was based upon Kngwarreye’s inseparable link to her country and its ceremonies. During the year following her death, Emily Kngwarreye was one of Australia’s three representatives at the Venice Biennale and her work was featured in a retrospective exhibition mounted by Margo Neale for the Queensland Art Gallery. Outstanding in a show packed with memorable images was a selection from the works painted in the weeks just prior to her death. With broadly brushed areas of luminous, almost fluorescent colours, these paintings looked like nothing ever painted previously by an Aboriginal painter. They mark a most extraordinary end to a remarkable career and parallel the last works of Henri Matisse, yet another artist with whom she was compared and about whom she knew nothing. It is tempting to see one of these works as a premonition of her death, with its surface of milky white paint. The mists are closing in; the dots, lines and other devices have been jettisoned. The image was later used to illustrate the cover of the Japanese catalogue for her second major retrospective held in Osaka, Tokyo and Canberra in 2008. If any single artist could be said to be the standard bearer for contemporary Indigenous painting, Emily Kame Kngwarreye must surely be the one. It is impossible to dispute the fact that, at their best, her paintings place Emily in the highest league of international artists of her time. According to Margo Neale, curator of her 1998 and 2008 retrospective exhibitions, ‘few artists have painted the country like she has, with an ability to penetrate its very soul’. Isaacs, J., ‘Bush Garden’, Art and Australia, issue 35, vol.4, 1998, pp.510-517. King, V., ‘Utopia Now: A Journey to Emily’s Country’, Art and Australia, issue 37, vol.4, 2000, pp.524-525.